and millions of celestial bodies (meteors, asteroids, comets) others. 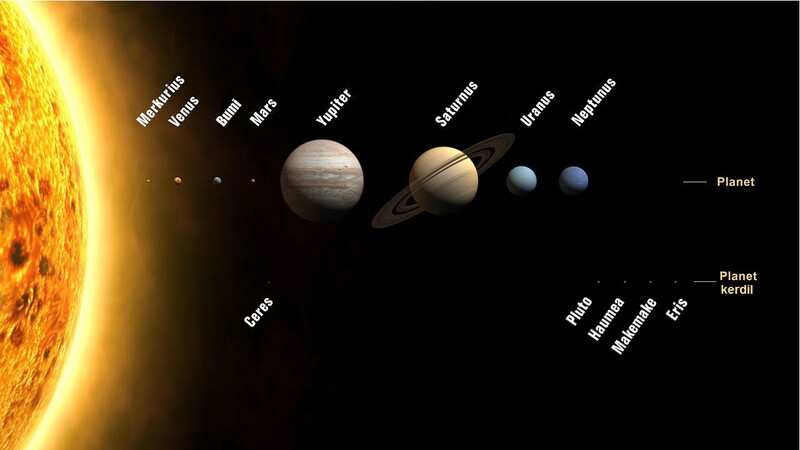 Solar System divided into the Sun, the four inner planets, asteroid belt, four outer planets, and in the outer portion is the Kuiper belt and scattered disc. Oort cloud is estimated to lie in the areas farthest distance of about a thousand times beyond the outermost part. • Neptune (4,500 million km). • Eris (10 100 million km). Six of the eight planets and three dwarf planets of the five was surrounded by a natural satellite, which is commonly called the “moon” in accordance with the Moon or the Earth’s natural satellite. Each planet outer planet surrounded by rings of dust and other particles.